So far, I've done these four plus monkeys in purple, persimmon, and gray. I went a little berserk with the 25% off yarn sale at Jo-Ann.com too so I've got a rainbow of other colors on the way. Can't wait to get my grimy mitts into all those colors! 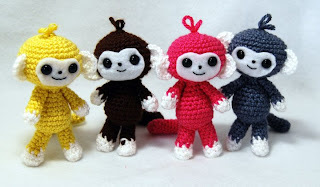 If the sunshine cooperates, my goal is to have a few of the monkeys in my shop this weekend. So, keep an eye on the shop or my Facebook page to learn the latest! They always get me with the % off sales! Oh wow lol you are obsessive compulsive :) but I love it!!! I WISH I was even half that! I'm a mess!